A huge conservation project has eradicated rodents on the sub-Antarctic island of South Georgia for the first time since humans arrived more than 200 years ago. Over the winter, the final examination of the British Overseas Territory was carried out with the help of three sniffer dogs, named Team Rat, which confirmed the extinction of the rodents on the island. Invasive rats and mice arrived on the island on whaling ships, many there to find fuel for Dundee’s jute mills, and preyed upon native species of ground-nesting and burrowing birds. In 2011, Dundee charity the South Georgia Heritage Trust started the world’s largest project to remove the invasive species to save the island’s important wildlife, including threatened pipits and pintails. Thery are already showing signs of recovery. 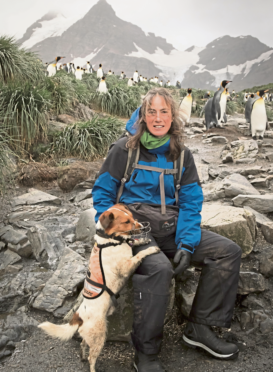 In an incredible feat of endurance and teamwork reminiscent of Sir Ernest Shackleton’s epic crossing of the island just over a hundred years ago, the handlers walked a total of 1608km, with the dogs covering a total of 2420km, searching for signs of rats. This distance, roughly the equivalent of a return trip from London to Dundee, is all the more impressive given the rugged and challenging terrain of South Georgia. Together, the handlers climbed the equivalent ascent of Mount Everest eight times over and the dogs climbed Mount Everest 12.9 times over. Mike Richardson, chairman of the charity’s restoration project steering committee, said: “Thanks to the outstanding work of the passionate and committed members of Team Rat and the board of trustees, the birds of South Georgia are free from the threat of rodents. Alongside the help of US associates, the Friends of South Georgia Island, the organisations raised £10 million to finance the project. Almost £1 million was raised from the UK Government through the department for Environment, Food and Rural Affairs. Lorne Gardiner, Parliamentary Under-Secretary for the government department division, said: “The UK is proud to be custodian of the precious and unique biodiversity of 14 Overseas Territories, most of which are island environments, like South Georgia, that are highly vulnerable to environmental change.